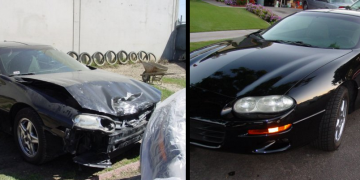 We’ve been providing quality Auto Body & Collision Repairs for over 30 Years. We understand that customer satisfaction is the end result of providing quality service and workmanship. We constantly try to set our standards higher, and we use the highest quality materials to insure our Lifetime Guaranty. Our technicians are honest and reliable, I-Car Trained and A.S.E. Certified. We offer Free Estimates and we will assist in any Insurance Claim. We can also Provide E-Mail Updates and you can see the progress to insure it will be ready on time. Thanks for visiting our site. Please use it to receive a FREE estimate, get driving directions, see our customer testimonials, and check out our recent jobs on the blog page. A school bus backed into my car 2 days after it was gifted to me 🙁 my dad kept the car in great condition for 11 years. The drivers side was significantly dented. I went to Rick after seeing his yelp reviews. He ordered the part the same day. I dropped my car off Tuesday and it was ready by Friday. He kept me updated about the insurance and when my car would be ready. I picked it up Friday and it looked even better than before the dent. He even shined my headlights which honestly I was more excited about. Great experience and the car looks great. Great experience at Kreher's. A friend of mine recommended this auto shop after I damaged my car in an accident. My car needed frame work, light body work, and new parts to replace the radiator and condenser and more. Rick kept great contact with me by phone and by email. He sent me pictures of the damages and the repair and gave me very fair pricing. He asked me which route I wanted to take to get things fixed in regards to after market and factory made parts. The repairs were made very quickly and he was very courteous during the whole experience. I'm very satisfied with Rick and the service at his shop. I had my 2010 Challenger repaired and it turned out fantastic! My last auto body shop I used a few years back did a really bad job with matching the paint and I was really upset about that experience. This time around my car came back to me looking brand new. Please support smaller quality shops like Krehers Kustoms, you wont be disappointed. I highly recommend Rick's Kustoms. I have a classic '56 Chevy that he did a great job on. Most collision shops won't even work on customs and most of the custom shops I went to assumed I had an unlimited budget just because I own a classic car. Rick worked within my budget and went the extra mile to make sure the car looked as good as it could. I am very happy and can't wait to get the car back on the road for everyone to see the awesome work he did. Hopefully I can afford to do more projects in the future with Rick. This professional has worked on many cars in my family in the last few years and now he's done great work on my truck. 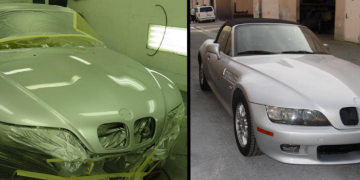 Although the quality of his bodywork and repairs are WAY ABOVE AVERAGE, his shop got the work completed in half the time and half the cost of what I thought an average body shop would charge. If you're in the SoCal area and need auto repair work done, this is the man to go to. A friend recommended Rick's Kustoms when I had been involved in an accident. I got a few estimates and not only was Rick's estimate the best but the quality of work was outstanding. His attention to detail surpassed my expectations. I would highly recommend you give him a call. Great service, great work!. I expected to just drop my car off and not hear anything about it until the pick-up date. Instead, Rick Kreher's technicians were constantly in contact to give me updates on the work, and I really appreciated that. Their communication made the difference. Rick even fixed things that weren't part of the job, just as a bonus. It was a pleasure doing business with them.. My wife's car had some damage on the trunk and the top. We needed to stop that before it spread too far. Rick Kreher was recommended to us by another shop. He did an excellent job. He was friendly and on time. I'm really happy with the the quality and service. I would use them again. They might want to get a credit card machine though. Rick's Kustoms has done collision repair on my BMW more times than I care to admit, also on my Nissan Maxima, my sons Chevy truck, my other sons Chevy Camaro and custom paint on my motorcycle. All with the care and attention to detail I have come to expect. This guy is the real deal! If you want it done right this is the place to go. Do not look any further if you need any paint and body repair done on your car. I am extremely picky and have been to several body shops through the years and Rick's Kustoms is the BEST ever! They did a great job of repairing my Infiniti G35 after I was in an accident. To my surprise when I picked up my car it had also been detailed and it looked brand new! I highly recommend Rick! Defintely an awesome all around body shop got my bumper fixed and did some general bodywork on my car. I will definitely come back to Rick Kreher Kustoms Auto Body Shop in Orange County or Anaheim, or Orange Ca area. Great Job Guys! Auto body repair or need a great auto body shop ? These guys are it here in Anaheim, CA. Please look no further! Rick Kreher Kustom Auto Body Shop is the place to go in Anaheim, CA for all your paint and auto body work. Fixed my 2006 Corvette and made it look like brand new again. Thanks Rick and team! For over 30 years, Rick Kreher's Kustoms has been setting standards for performance and superior collision repair services in the automotive industry. 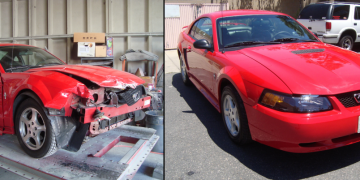 We aim to continuously exceed the expectations of our client and to deliver quality auto body services to the Orange, CA Area. Our technicians are fully trained and educated in providing a safe and friendly working environment. All employees have passed an extensive background check. We offer quality customer service along with very competitive rates. Building long-term customer relationships founded on high quality performance is the cornerstone of our business. Why should you settle for anything less?